Hey ya’ll! School is officially back in full swing, the new is wearing off and the stress of all that comes along with our jobs might be starting to settle in. It drives me crazy when people say that teaching is easy. There is a lot more to our job besides just teaching different subjects. We have lesson plans, meetings, copies to make, grading papers, entering them into the grade book, and oh the paperwork. Not to mention printing and laminating resources for the weeks ahead of time. As teachers, we get a planning period each day. Last year, mine was 50 minutes, I know some schools get less than that some get more. I’m sorry but it is impossible to get everything we need done in that 50 minutes. So what do we teachers do? We stay late after school, we load down our teacher bag (which weighs a ton ya’ll) and haul it home every day and even on weekends too. Our work is never done. So how can we get more work done at school so that we have more time with our families at home? 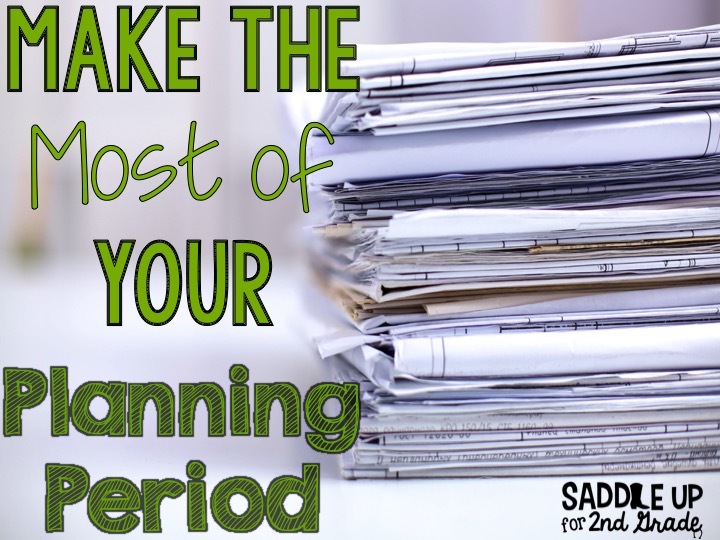 We can do that by making the most of our planning period by setting a schedule. My first two years of teaching, I wasted so much time trying to get it ALL done in 50 minutes. I never got anything accomplished. I would work on lesson plans for 10 minutes, grade papers for another 10 minutes, then I would try to make copies of a few things. It was really a nightmare honestly. I was trying to get too much done in a short time. I finally set a schedule for my weekly conference time and it helped me so much. Here is a general run down. Mondays: Type up weekly newsletter and put it in their pick up folder along with their weekly spelling list. Graded paperwork from the week before was also placed in their folders. In 2nd grade, I’m all about teaching responsibility. I had a crate with hanging file folders. Each child had their own pick up folder. This is where I put all graded works, notes to be sent home, newsletters, etc. At the end of each day, they are responsible for getting their work and putting it in their take home folder. Then, I start looking ahead at what I’m going to teach the next week and jot down ideas. The kids left every day at 3:30 and teachers are required to stay until 4:00. I’d use that 30 minutes to straighten things up, and making sure I had everything ready for the following day. I would also use this time to complete any paperwork that I had. It might have been at RTI form or guided reading data. Tuesdays: I met with my co-teacher and we planned out the next week. We taught the same concepts but used our own materials. If there was time left, I would start pulling materials to make copies. Wednesdays: I would write out my lesson plans for the following week and search for ideas on TPT. I’d then pull files to make copies. After school, I’d print anything new that needed to be laminated. This might be centers or new activities. Thursdays: This was my copy day. Copies for the next week were made and anything that needed to be laminated was done. Sometimes I would file away original copies and put things into their weekly drawers. Fridays: Fridays are my filing days/station day. If I didn’t get it done on Thursday, all of my copies for the next week are put into weekly drawers and all of my original copies were filed back where they belong. Centers and math stations are set up for the next week so that we are ready to go Monday morning. I never stay late on Fridays. We went to computer lab twice a week for an hour. My school doesn’t have a lab aid so I stayed in there with the kids. If we weren’t working on a project, I used this time to grade my papers and enter them into the grade book. If it is taking you longer than 2 hours a week to grade papers in the primary grades, you are giving to many worksheets. Also, anything that we used weekly such as morning work, I ran copies off six weeks at a time. This way, I had it prepped in advance and it was ready to go. There were some days days where I still had to stay late after school or something came up and I had to take my lamination home to cut out but by setting a schedule, I reduced the workload that I had to bring home. I’d tackle one thing each day rather than trying to do several small things. Think about what you need to get done and start there. Work on a little each day. Then try to leave it at school. Make it point to go home on time 2-3 times a week. Use that extra time to enjoy your family and time for yourself.